Bride and Groom, long before you two had the pleasure of knowing each other, your families provided you with a foundation of love and support which has made you the people we see before us. To honor your families and all they have given you, you each will start by adding dirt from your childhood homes’. Just as your families have been the foundation of who you have become, this dirt will be the foundation of your new family. Your family that starts today (It doesn't have to come from your childhood home, the wording can be changed to fit). The love of their families has allowed Bride and Groom to grow into the wonderful, and unique people they are. Love is the essence of human experience and emotion. Love gives us the firm base to grow. This tree will continue to grow just as Bride and Groom create their life together. With constant nurturing and nourishment this tree, and your marriage will grow strong and resilient. It will weather the challenges of daily life and the passage of time. With your family supporting you today, you are starting with strong roots and will continue to grow. Halfway plant your plant for the ceremony. Fill two small containers with potting soil, one for each of you. Make sure there is a little water in the watering can. 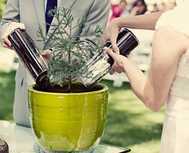 During your ceremony, each of you will add your portion of dirt and then water together!